1) Keeping bird density uniform throughout a house is crucial if heat stress is to be minimized. During tunnel ventilation it is not uncommon to see a difference in density of 30% or more between the pad area and the fan end of the house. Even with sufficient wind speed this density difference will often be a two-or-more-degree difference in bird body temperature (Figures 1 and 2). The combination of elevated body temperatures and reduced access to feeders/drinkers will lead to significant reductions in bird performance. 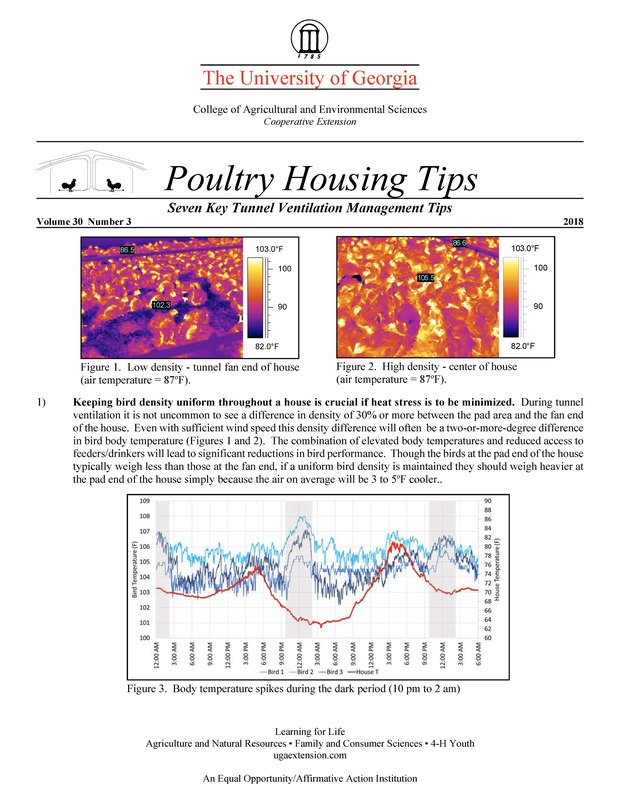 Though the birds at the pad end of the house typically weigh less than those at the fan end, if a uniform bird density is maintained they should weigh heavier at the pad end of the house simply because the air on average will be 3 to 5oF cooler..
2) Long dark periods at night can result in increased heat stress during hot weather. The shorter the daylight period, the more active the birds will be during the day as they try to consume the feed they need over a shorter period of time. The increased activity and rate of feed consumption will result in greater heat production during the daylight hours resulting in higher body temperatures and increased likelihood of heat stress. Furthermore, body temperatures will tend to be elevated at night because the birds will tend to sit for long periods of time. Though many believe that birds sitting during the day is a significant problem, the fact is that they are very active compared to what happens at night. When the lights go off the birds sit, and body temperatures will often increase a degree or more as heat loss through the underside of the bird is virtually eliminated when they sit on the litter (Figure 3). The longer the bird sits, the longer its body temperature will remain elevated and the more performance is likely to suffer. 3) Evaporative cooling pads should be set to operate at 85oF and not 80oF. During hot humid weather when the inside temperature is 80oF, outside humidity is typically above 80%. Turning on the pads under these conditions will tend to decrease house temperature only a couple of degrees and will cause the relative humidity to increase to 90% or more in the morning and late evening (Figure 4). It is important to keep in mind that a bird’s respiratory system acts essentially as an internal evaporative cooling pad, helping to remove over 50% of the heat from the bird. When the house’s pad system nearly saturates the incoming air it dramatically reduces the effectiveness of a bird’s own internal evaporative cooling system. By delaying evaporative cooling pads until the house temperature reaches 85oF, the outside relative humidity will be lower when the pads do come on, which will result in lower house humidity and cooler birds. 4) During the last 1/3 of a flock, concentrate on what you are doing at night as much as what you are doing during the day. Nighttime temperatures are in the mid-seventies and the humidity near 100% can be extremely stressful for near market age birds. Though air temperatures may be lower at night than they were during the day, the humidity may be 10 to 20% higher at night, which can increase the effective temperature by 5 to 10oF. Making matters worse the bird’s body temperature will increase when the lights shut off. The combination of all these factors makes running all the fans at night just as important as it is during the day. Tunnel fans should be set to not shut off until the house temperature decreases to within a couple of degrees of the target temperature. If high air speeds are maintained throughout the night it not only makes them more comfortable at night but will also make them better able to handle high house temperatures the next day. Figure 5. Illustrates the deep body temperature of a bird during hot weather conditions in a house with minimal air movement. For the first two days, daytime temperatures were in the mid-eighties and nighttime dropped into the mid-seventies. During the hottest portion of the day, bird body temperature rose to approximately 111oF (112 - 116oF is considered lethal) while at night, body temperatures dropped to around 109oF (105 - 106oF is considered normal). On the third night house temperatures dropped into 68o,F which resulted in the birds body temperature decreasing to normal levels. Interestingly, even though house temperature increased to 85oF, the same as the previous day, daytime body temperatures were approximately two degrees lower. Since evaporative cooling does not work at night and as a result it is impossible to decrease the house temperature to 68oF when it is 75oF outside, the fact is that by keeping air speeds high at night you can remove heat from a bird at night, lowering its body temperature, making them not only more comfortable at night but the next day as well. 5) During the last 1/3 of a flock, when in doubt turn on more fans. When house temperatures are 75oF or warmer you are not going to harm the birds with air movement. The fact is that a near-market-age broiler is physiologically very capable of handling a “cool” house. They possess a high R-value feather coat, have a low surface area-to-volume ratio, and produce five times the amount of heat per pound than we do. A market-age broiler prefers house temperatures much colder than many believe. Researchers found that operating a house during the last 1/3 of the flock roughly ten degrees lower than commonly considered “normal” (day 27 - 62oF, day 39 - 57oF) only reduced the weight of the birds by 0.06 lbs (7.94 lbs to 7.88 lbs.) but improved feed conversion rate by 6 points (1.71 vs 1.76) (I, Zahoor, et.al., 2016). Even with commonly used air speeds of 600 to 700 ft/min, it is highly doubtful that effective temperature could be decreased to even this level, let alone to the point where you would actually harm the birds. 6) Though house temperature, as indicated by controller sensors, may not change when you add or turn off a fan or two, this doesn’t necessarily mean that there wasn’t a change in “effective” temperature. Figure 7 is a thermal image taken in a house with near-market-age birds with all the fans operating. The air temperature in the center was 78.9oF and the average surface temperature of the birds was 85.1oF. Three fans were turned off and the air speed decreased to approximately 400 ft/min (Figure 8). Though the air temperature above the birds barely changed, the reduction in air speed resulted in less heat being pulled from between the birds, which resulted in an increase in bird surface temperature of approximately four degrees. Temperature sensors are in fact a poor measure of bird comfort during hot weather. Rather, a bird’s thermal comfort is more determined more by air speed, density, and humidity than temperature during hot weather. For the most part, the one factor that we have the most control over is air speed so, don’t be afraid to use it. 7) Do not worry about bird’s sitting down when air speed suddenly increases with market-age birds. This is a natural reaction. They are not necessarily sitting down because they are cool, they are more likely simply responding to a change in the environment. The same thing will happen when there is heavy rain. The increased sound momentarily startles the birds and they will sit down. If the air temperature is in the mid-seventies, they are not too cold. In both instances, after they get used to the change you will see birds start to get up eat and drink. Keep in mind as a rule of thumb, no more than about 20% of the birds will generally be up, eating and drinking at any one time.